Could the city that never sleeps be in the wake of a fatal collapse? That’s the gothic image of Gotham portrayed in a new 90-second public service announcement by Y&R for a campaign supporting the New York Organ Donor Network. The animated ad opens in Grand Central Station as its fabled clock slowly stops ticking. Dark clouds storm the sky, buildings crumble, and the Statue of Liberty hangs her head in sorrow as the city struggles to simply survive. Yet, the undying spirit of New Yorkers drives them out into the streets to save the city, bit by bit, including the top of the iconic clock. They build them into it a wondrous machine that resembles a beating human heart, which slowly seems to come to life and revive the city to its former glory. 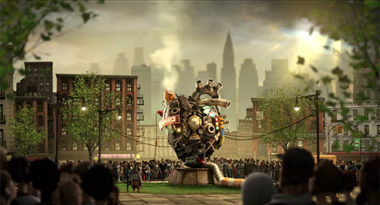 The ad closes with the tagline, Keep New York Alive, followed by heartfelt words about organ donation as viewers are sent to LongLiveNY.org for details. Adweek.com featured the ad and explained the heart of its message. New York currently has the second-to-lowest percentage of state residents registered as organ donors. A New Yorker dies waiting for an organ every 15 hours, yet less than one-quarter of the population are registered as organ donors. The campaign responds to this shameful status by encouraging residents to register for organ donation to save the lives of these people in need. Extensive research went into choosing the best approach for the campaign to make sure that it struck the right chord with New Yorkers and drove them to register as donors. Then, Oscar-winning director Laurent Witz used a 3-D animation style to add a sense of urgency to every single frame. The result was a graphic campaign that captured the spirit and pride of residents and reminded them of their urgent role in keeping New York alive. Know what’s new in advertising and branding. Contact MDG Advertising. MDG Advertising, a full-service advertising agency with offices in Boca Raton and New York, NY, is one of Florida’s top branding firms. MDG’s capabilities include print advertising, direct mail marketing, branding, logo design, creative, digital advertising, media buying and planning, radio and TV advertising, Web design and development, online video advertising, infographic development, email marketing, mobile marketing, content marketing, social media marketing, and SEO. To learn about the latest trends in advertising and branding, contact MDG Advertising.